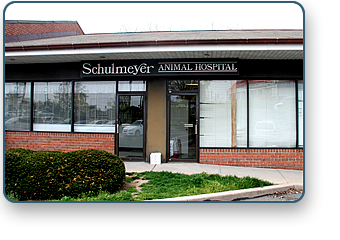 Welcome to the Schulmeyer Animal Hospital in Perry Hall, Maryland. Our practice has been serving the Perry Hall area for over 20 years with concern and compassion for our patients and their owners. Our hospital is a full service facility providing diagnostics, care and treatment in all areas of modern small animal medicine and surgery. The goal of our hospital is to provide quality, dependable and concientious care for all our patients. 4138 E. Joppa Road, Baltimore, MD. Please call us at 410-256-PAWS (7297) to schedule an appointment.